Secret Farm: A garden blog: Romanesco? Where's the freakin' Romanesco already!? Seriously. I read that they take forever, but this is ridiculous. There is not even a hint that any of the 4 plants I have are even thinking of forming a head of anything resembling broccoli. I even started them indoors for crying out loud! All they have done is get gigantic and crush everything in their path, and then fall over in the garden and crush some more stuff. Ok. that's about all the good the bitching is going to do. Anyone else grown this? Did you have any luck? How freakin' long does it take? Do I have any hope of getting even a tiny underdeveloped floret before the snows come? I've never grown Romanesco (a variety of broccoli? ), but perhaps it's waiting for cool weather? I've had broccoli sit and just look ugly and then go nuts when the weather suits it. My kale (another member of the brassica family) languished all growing season. During these past two weeks of cold, it transformed from a kale plant into a kale super-shrub. I think those folks who get early broccoli plant outdoors in April. Those same lucky gardeners probably get a full head of cilantro, too, before the plant bolds. Thanks Greengirl! I keep checkin' that damn Romanseco, and it's not doing a thing except being a big huge garden hog! I'm keepin' my eye on you Romanesco! Yeah, Romanseco? Not so much. Still absolutely nothing resembling anything we can eat. Poopy! want to now, were can I get seed in south africa for romanseco or were can I get one. Well Marika, I got my seeds from Seeds of Change, I believe. I don't know if they ship internationally though, or if Romanesco is suited to the climate in South Africa. I wouldn't advise growing it anyway, as it NEVER GREW ANY HEADS! Yep, nothing - just big leafy monsters that took over the garden! I'd advise doing what I'm going to do next year, grow some nice ordinary broccoli. Accckk! I hope mine grow heads. There is still plenty of time left (only late spring atm). I started them real early indoors under fluorescent shop lights. My first time having a garden and growing romanesco (italia). Got my seeds from rareseeds.com Superb leaf growth so far. They are pretty darn big already so I figure worst case scenario (if they don't form heads) I can at least eat the plentiful huge leaves. 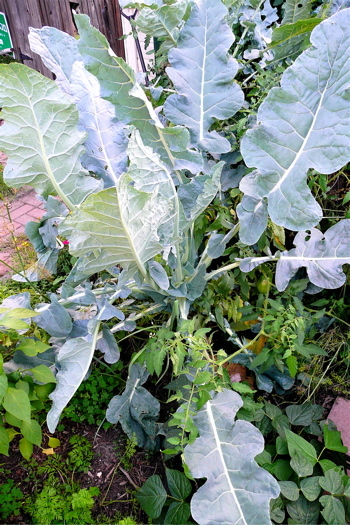 I read around and broccoli/cauliflower leaves are edible and this is a close relative (more-so to cauliflower). So if anyone else is afraid to try this plant just remember you can eat the leaves :) They are higher in some nutrients than the head. Such as beta carotene. Still crossing my fingers I get some 1lb lime green heads with the incredible looking fractal patterns. Good luck James! I hope they work for you. I just don't have the space for such a selfish monster! Thanks Lorika! Yeah they sure grow into monster sized plants alright. Planted 12 of them (between a friend and I) and they are so crowded. I planted carrots and chives a couple feet in front of them and the romanesco is so big now it overtook and covered them entirely, haha. Unusually cool summer this year which is probably in my favor. About 2/3rds of them seem to be growing heads now, although the sizes vary widely. Harvested the largest head which is about 3/4ths a pound. Some seem to be stalled. On a couple the heads are very small and purplish and not growing. Might be due to us forcing the middle leaves open to check for heads. I get the feeling that may have stunted those. Perhaps they need the protection while forming. Will probably try a few romanesco next year, but some regular broccoli as well. I'm so glad you got some to work for you James! Let me know how they taste, and if you think they are any better then regular broccoli - I'm dying to know. I believe its the secret if success. Very recommendable. i need help for a school project on this! does anyone know how long growing season is what type of plant it grows on and how long does it take to produce the veggie sfter planting the seed? i need answers ASAP! !